Israel is shocked by international criticism of the work on a Jewish-owned property in Jerusalem. Calling it “a settlement is…an insult." Israel is shocked by international criticism of the demolition of a Jewish-owned property in Jerusalem. "Calling Jerusalem a settlement is a misinterpretation, an insult to the history of the city," Israeli Foreign Ministry spokesman Yigal Palmor told the French news agency AFP. "It is incomprehensible that they are mixing questions of private rights, international law and politics," he added. He was reacting to European Union and American condemnation of Israel for Sunday’s demolition of the old and unused Shepherd Hotel. The lot is owned by Irving Moskowitz, an American Jew and a strong supporter of a Jewish presence in all of Jerusalem, Judea and Samaria. Plans were approved last year to demolish the building in order to allow the construction of a Jewish housing complex. The Prime Minister's Bureau pointed out in a statement that the government was not involved in the demolition and that it was carried out “in accordance with Israeli law. There should be no expectation that the State of Israel will impose a ban on Jews purchasing private property in Jerusalem. No democratic government would impose such a ban on Jews and Israel will certainly not do so. U.S. Secretary of State Hillary Clinton called the demolition a “disturbing development,” while Catherine Ashton, the foreign policy chief of the EU, repeated her oft-stated stand that ”settlements are illegal under international law, undermine trust between the parties and constitute an obstacle to peace." The EU, the United States and the United Nations does not recognize Israeli sovereignty over what it calls “East Jerusalem,” meaning large areas of southern, northern and eastern Jerusalem that were restored to Israel in the Six Day War in 1967. The term "settlement" also has been used by U.S. President Barack Obama when referring to United Jerusalem. An internal EU memo suggested that the group of countries might post observers in Jerusalem, but officials said that the only thing new about the proposal is that it was leaked to the media. 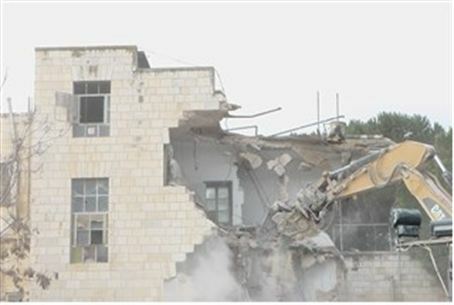 The Arab world joined the condemnation of the demolition, with the Arab Monitor stating that the demolished building was on an “historic site." The adjacent hotel was the former home of the Mufti of Jerusalem, known for his close ties with Hitler. Egypt raised the threat of “a new explosion of violence" because of the demolition, which marks progress in Moskowitz’s plan to build 20 residential units on the site. Jordan warned that “instability” in the region would follow.